In the last couple of years the words “local” and “authentic” became really viral among any kind of travelers. Avoiding tourist traps, finding own paths and making friends with the natives is getting as normal as booking all-inclusive tours 7-10 years ago. In my opinion buying magnets or t-shirts with “I love “blahblah place” are rather a poor taste than real attention. And if you travel to Georgia, what can you bring to your loved ones? 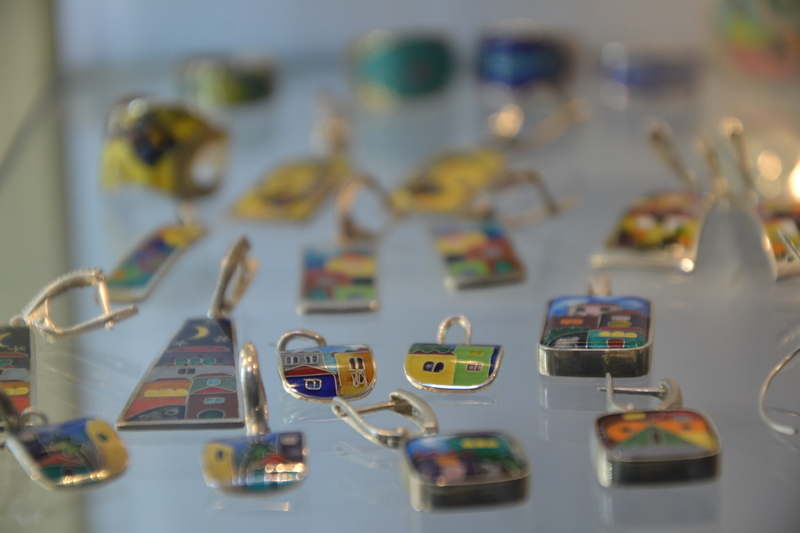 What can you buy for yourself – something better than above mentioned magnets? If you know me and Georgia a little bit, you might be surprised that I am not convincing you to buy wine and churchkhela (delicious natural sweet made of grape juice and walnuts)… Well, it is always good, as Georgia is a wine producing paradise, but at the same time such kind of souvenir is way too obvious. You could do it without my help. 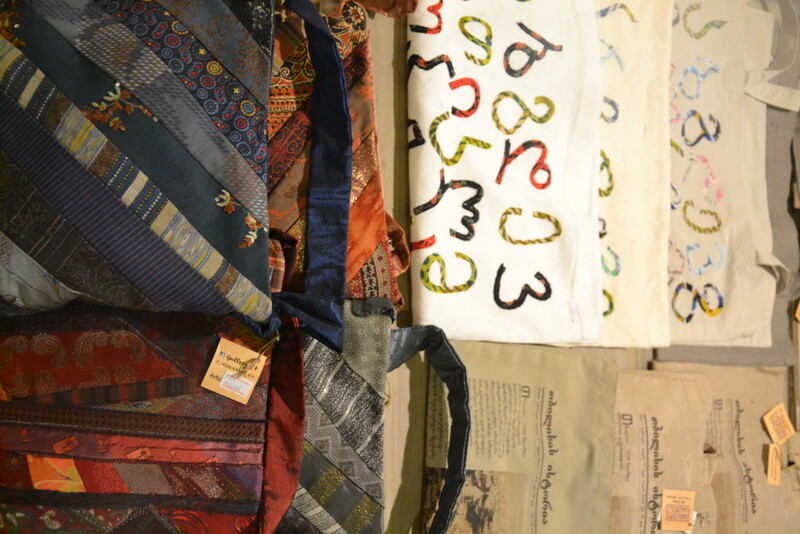 I would draw your attention to some local products, which are really authentic (hope you noticed my efforts to use both trendy words in one sentence), some truly Georgian things produced here for centuries, which I like myself. My recent affection, this typical Georgian thing is a good present for a person who likes to combine ethnic elements in his/her home. The thematic patterns and variety of colours (though the most classical one is blue and white) look simple and beautiful. 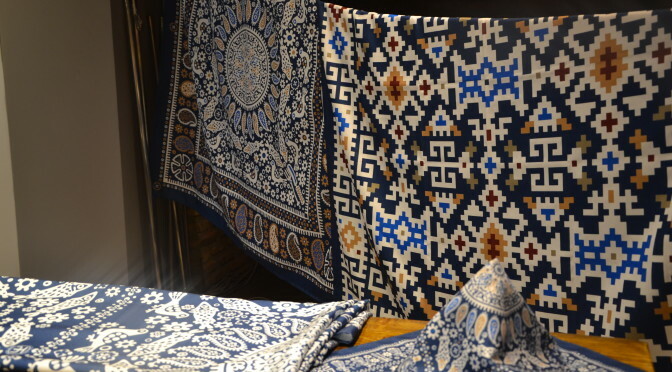 To me as a huge fan of Georgian culture it is also a part of preservation and spreading of local motifs and ornaments, so as I will have my own home, I gonna buy such a tablecloth for myself as well. As I was walking and making pictures for you, I made a small market research as well. 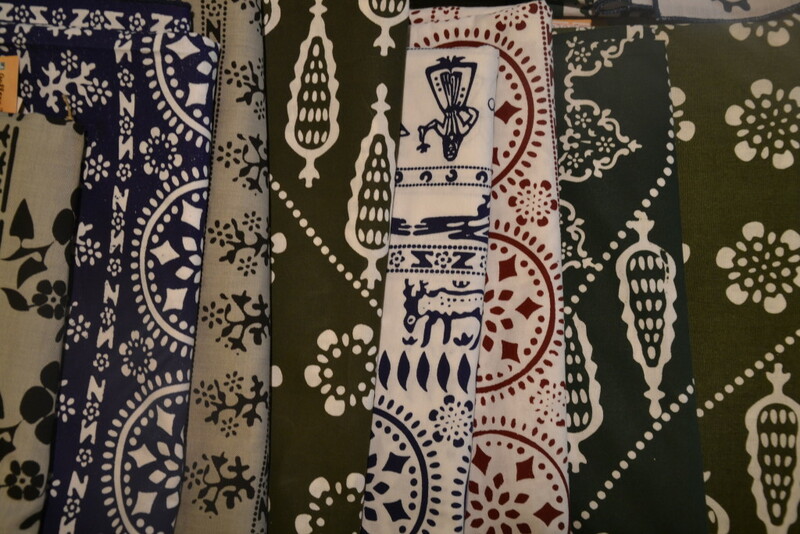 So for a small piece of such cloth (rather a big napkin size) you might pay about 30 lari (12 USD). For bigger ones – around 90 – 110 lari (36-40 USD). As for the places to get them, I’d recommend to go to Karvasla (the one near Sioni church) or a shop behind the Spanish restaurant at Meidani square. 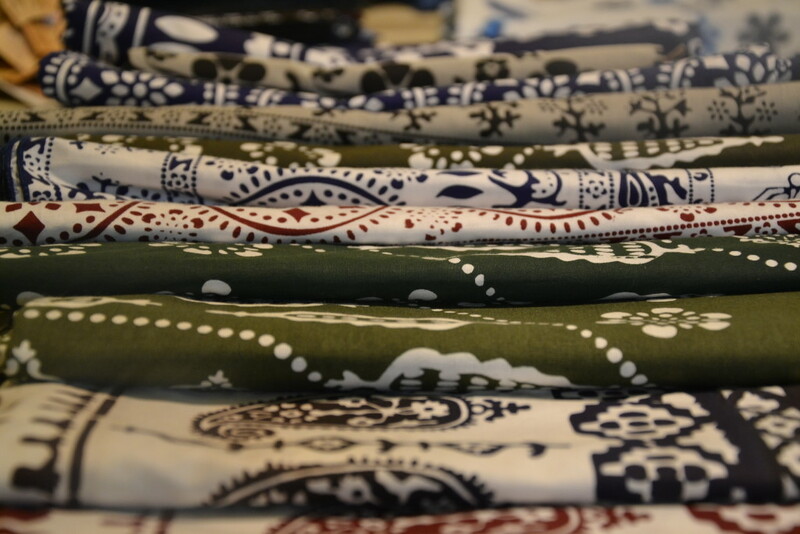 Even though the tourists flow there is quite huge, I found the price/size/quality balance quite good. 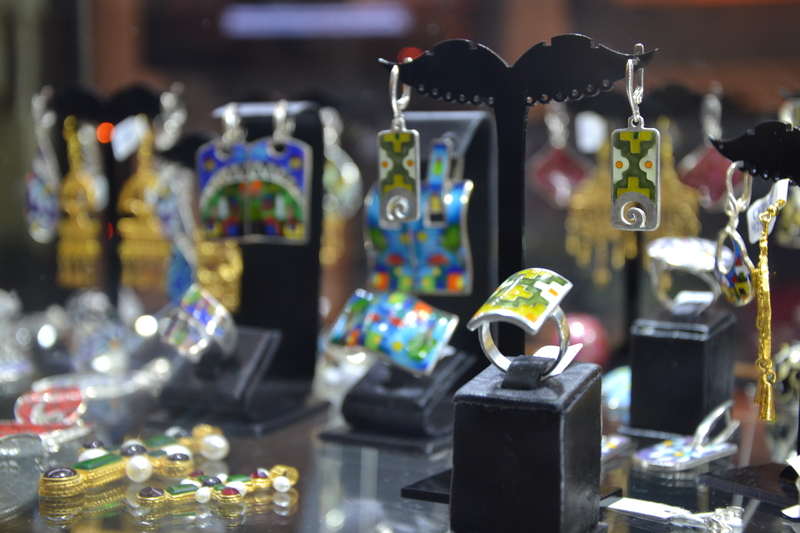 Another cool piece of Georgian handcraft, minankari jewelry is made in accordance with an old technology, which is preserved till now – though, sometimes a bit modified. Basically the enamel is put on silver, gold or any other kind of metal, then it is baked, and then the procedure is repeated once again. In short – it is double layer of enamel baked twice. Always handmade, that’s why not cheap. The starting price for a small piece of minankari jewelry is about 30 lari (about 12 USD). 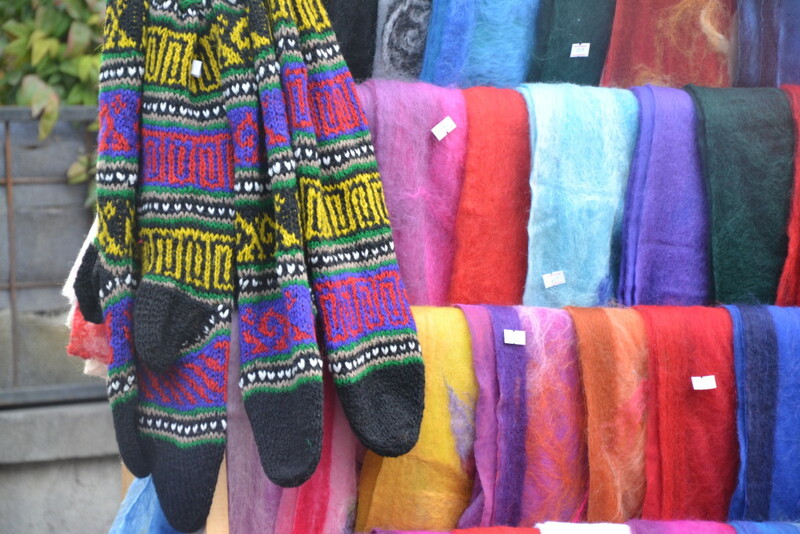 I wouldn’t advise to buy this kind of souvenirs at Leselidze/Kote Aphkhazi street. Way too overpriced. Just next to that street you can find two galleries with excellent (and quite pricey) works: Ornament Gallery at Erekle II street and Pokany Gallery at Bambis Rigi 7. Quite often I am also taking my guests to above mentioned Karvasla, an old caravaiserai building near Sioni church, where you can find some small shops of local producers. 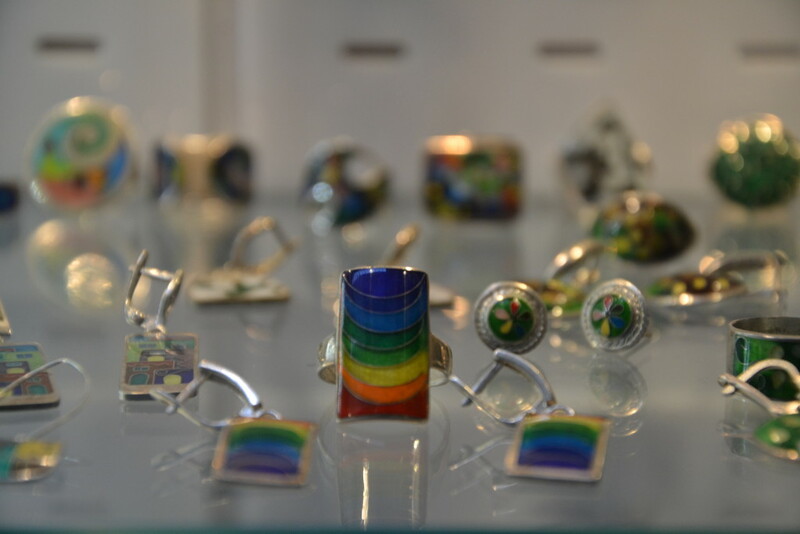 My favorites are Gallery 27 and Nima Gallery. 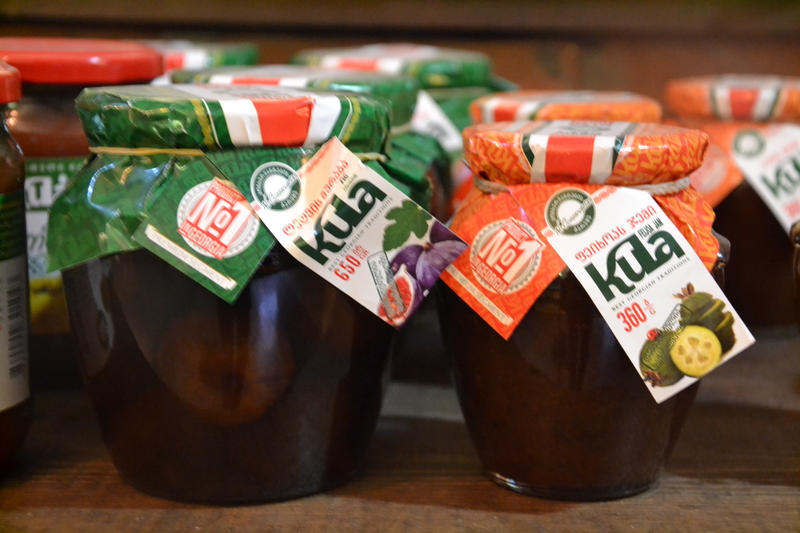 I am sure you have some kind of local jam in your country as well. But my big love for local jams (which makes me exercise a lot) forces me to say it loud: walnut, white cherry, feijoa and pine cone jam is a must try and maybe a must take some for your family and friends. 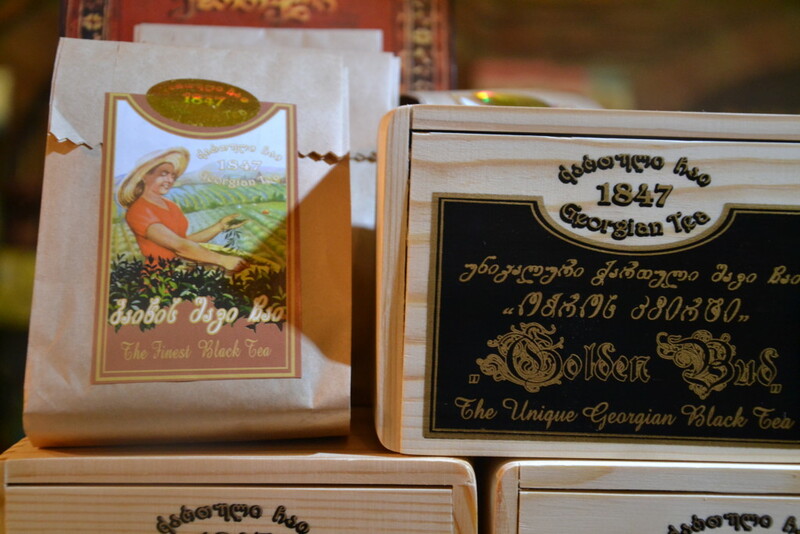 Georgian tea is good as well (you might buy the most popular brand Gurieli in every supermarket, or go to Galaktion Tabidze street: at the crossing with Lermontov street there is a small tea shop, where you can purchase good tea from Guria region). 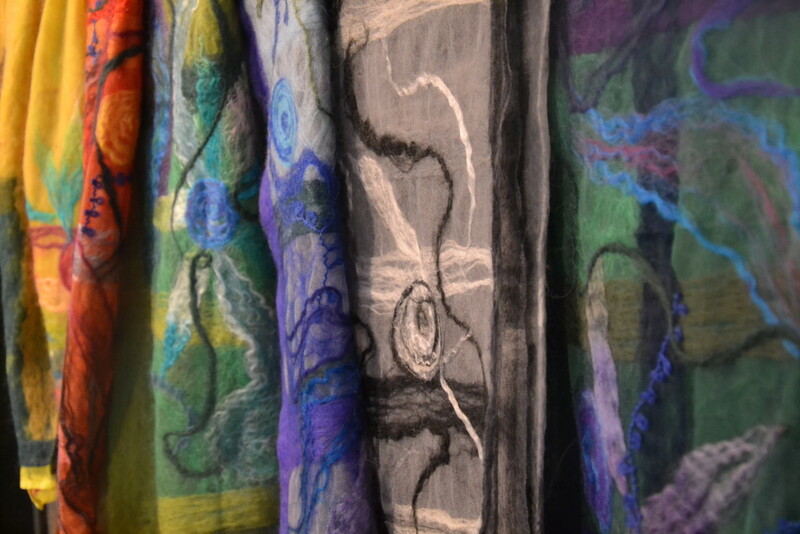 Again, I have such a scarf too, it is warm and beautiful. Besides my “supporting local production”-idea, I just really like wearing bright things you can buy just here. The prices start from 35 lari (about 12.5 USD). The Georgian handcraft also includes a huge variety of bags and accessories. 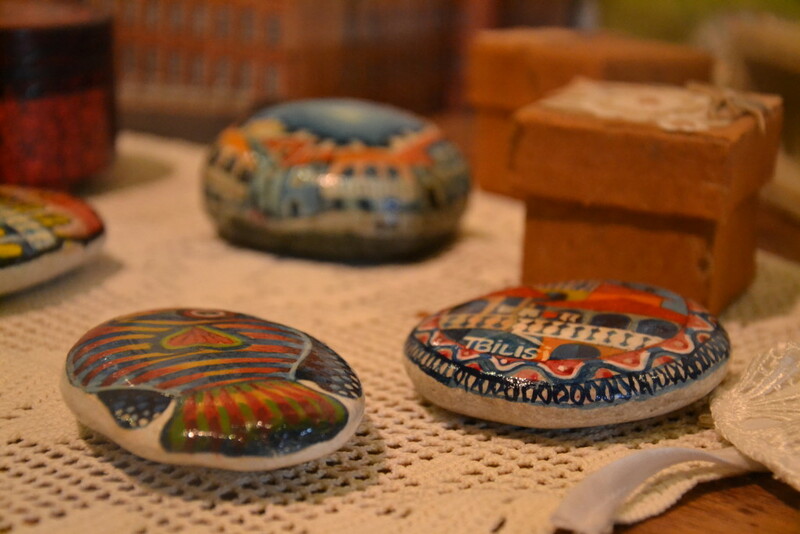 Here I post some pictures of them, so that you can imagine… The painted stones are made by Mari Chkhartishvili, an artist I know personally. As I know, she is also making small pieces of jewelry and is painting too, but the stones are the kind of small souvenir I really like: it’s not a magnet, a plate or a cup with “I HEART SAQARTVELO”, and it is not a huge expensive painting which is not easy to transport. It is a small handmade painting on a tangible piece of Georgia! Those you can buy at the market or in the supermarket are delicious, but you can’t always carry them with you – it all depends on package and carrier rules, and many other things… And also the classic sulguni or Imeretian cheeses are just mainstream. If you happen to travel to Javakheti region, please notice that in Poka monastery near Paravani lake the nuns prepare awesome kinds of cheeses (and also chocolate, oils and jams – that goes to the p.3)). Dozens of them! And also in Tusheti or in the lower parts of Kakheti you might find some rare sorts of cheese (guda and dambali are the most famous ones). 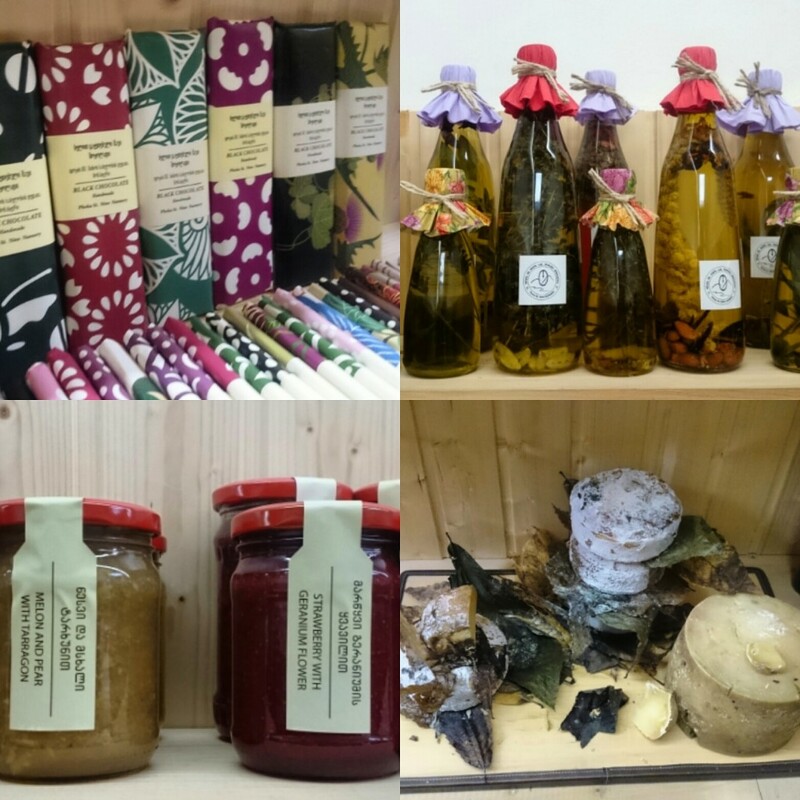 In Tbilisi I could recommend to go to Aristaeus shop at Pushkin street (next to Warszawa bar), or, if you like something really local from a non-touristic place, head to Kazbegi avenue 20A, to “Cheese House”. Cheeses marinated in wines, dry cheeses, soft cheeses… It’s a small paradise for me, and I hope that you will like it too.